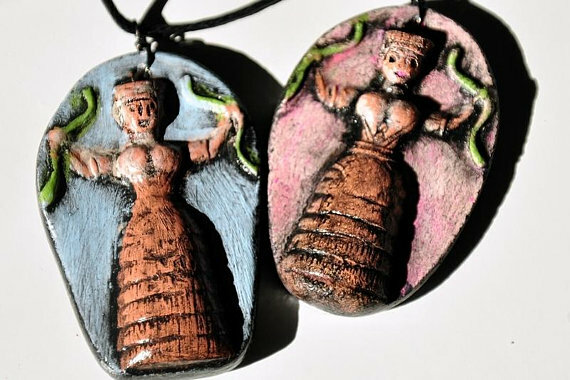 This one of a kind pendant doubles as a pendulum. It is a truly unique piece that is light weight and smooth to the touch. 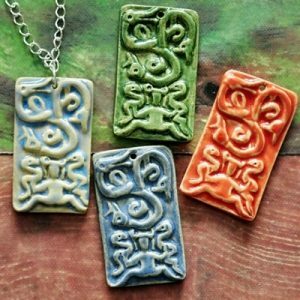 The light brown glaze makes this necklace an easy accessory with many color schemes and styles for most occasions. Length is adjustable with sliding knots at the end. 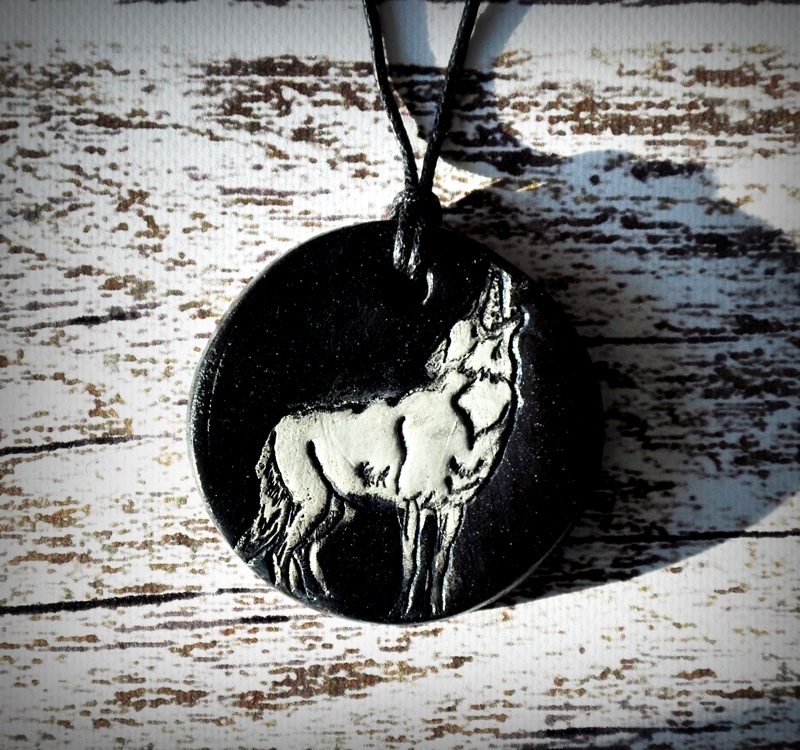 Pendant piece measures approximately 1.5″ long x 1″ at its widest point. 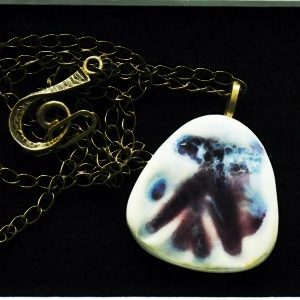 This pendant is truly a piece of wearable art, a one of a kind that is sure to draw attention. ade from stoneware clay that was imprinted with a vintage lace pattern, and given a star cut-out hole for the string. After a first kiln firing, it was washed with a stain and spot glazed with red, and finally a clear coat of glaze overtop. 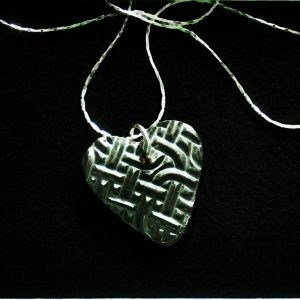 The final result is a stunning one of a kind pendant that can be worn with a wide selection of outfits. 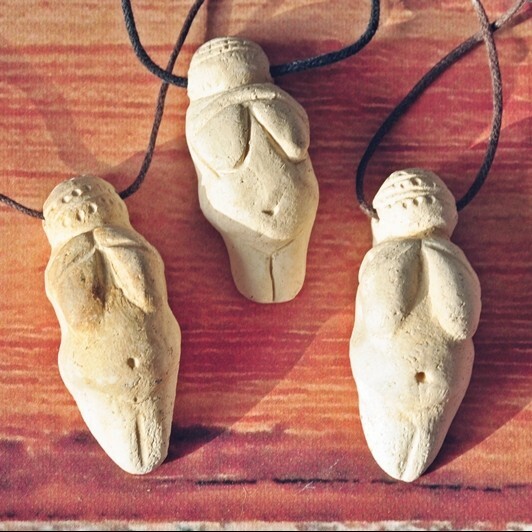 Measures approximately 1-1/4″ across x 1-1/2″ high. Cotton cord is adjustable in length. 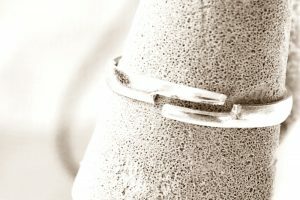 Wear it long, or pull the slip knot at wear as a stunning choker. 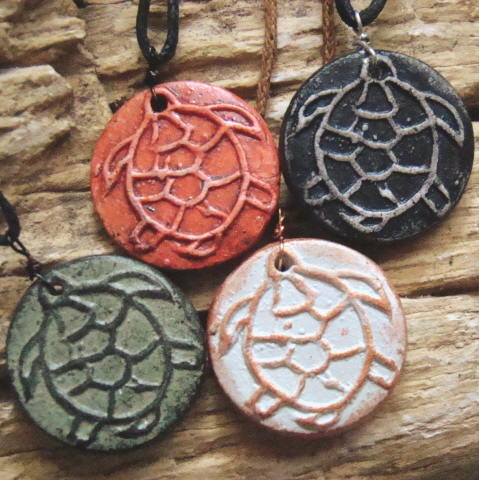 This pendant/ring set is made from glazed stoneware. 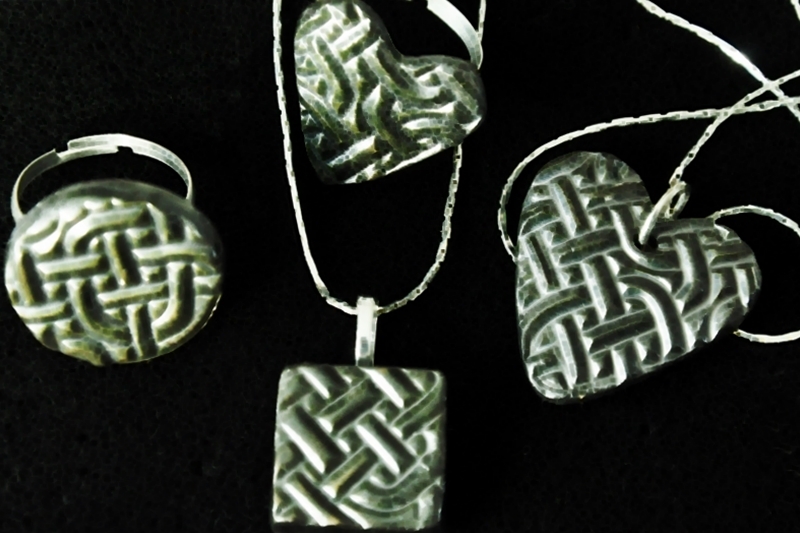 The surface has a Celtic knot texture which is enhanced by the black wash in the grooves. The finish is glossy. A great jewellery set that will last a lifetime. It can be dressed up or worn with casual wear. 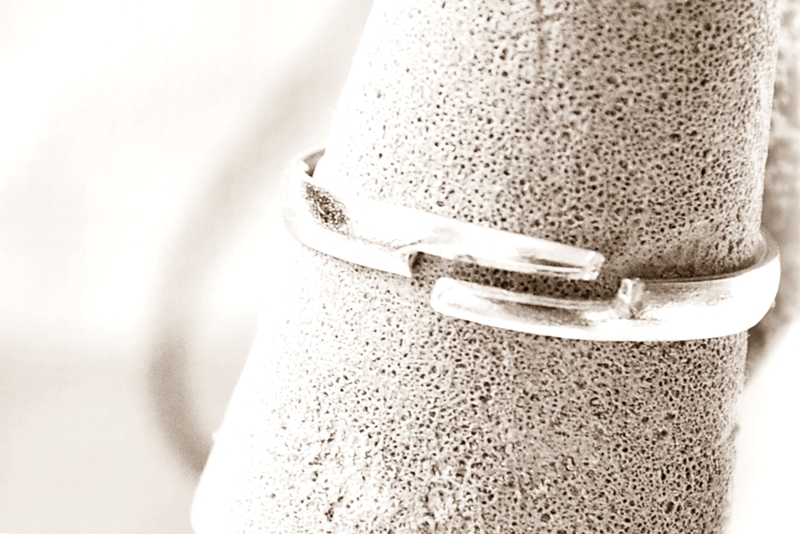 Ring measures 1″ (2.54 cm) tall. The ring band silver plated and the size is adjustable. 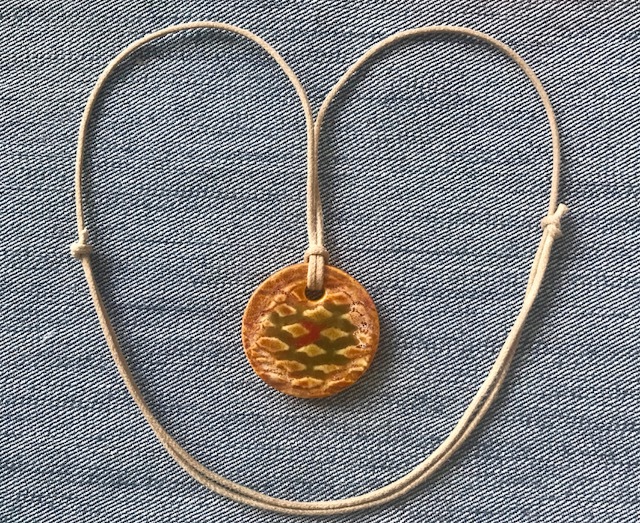 Pendant piece measures 1″ (2.54 cm). It comes on a cotton cord with sliding knots to adjust the length. This pendant is absolutely stunning on. Made from stoneware clay that was imprinted with a vintage lace pattern. After a first kiln firing, it was washed with a stain and spot glazed with red. It has a pleasing matte finish, except for the dots of red. The final result is a stunning one of a kind pendant that can be worn with a wide selection of outfits. 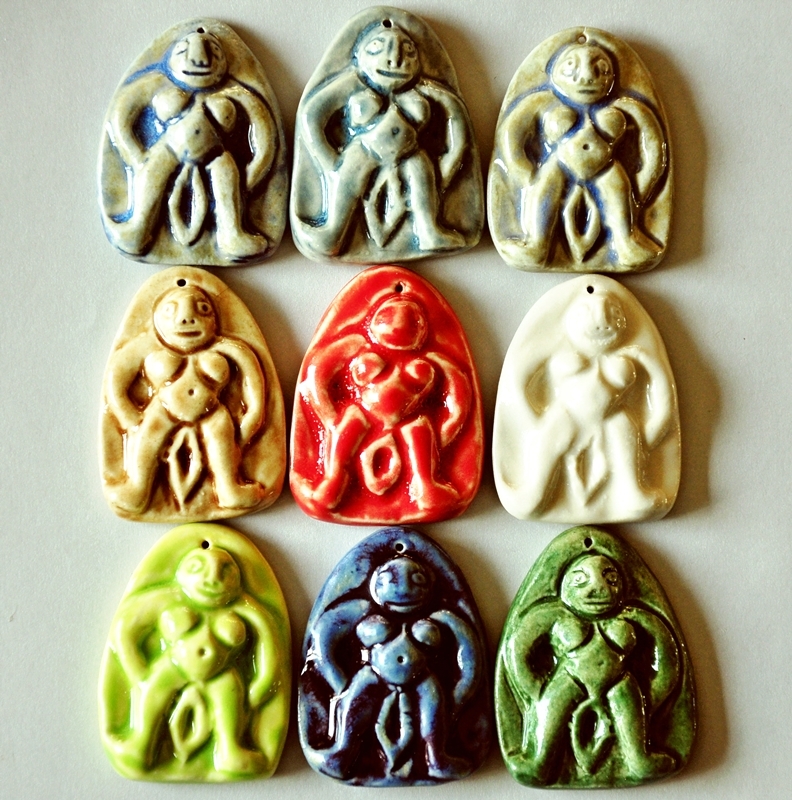 Measures approximately 1-3/4″ across x 2″ high. Cotton cord is adjustable in length. Wear it long, or pull the slip knot at wear as a stunning choker. 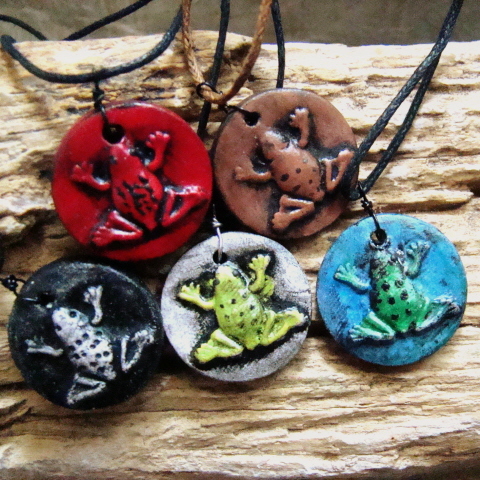 Pendants may have slight variations. 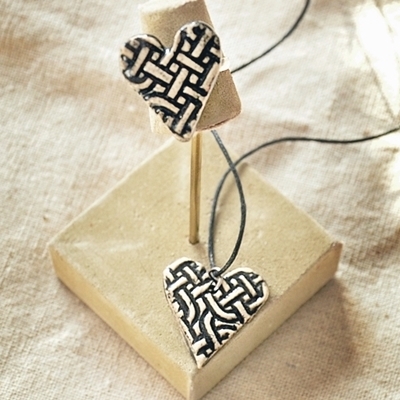 This one of a kind heart shaped pendant is made from stoneware and glazed in Black Diamond metallic art glaze. The surface has an interesting Celtic knot texture. Other colors are available by special order. Pendant piece measures 1″ (2.54 cm. The silver plated chain measures 16″ (40.7 cm). A matching ring is available. 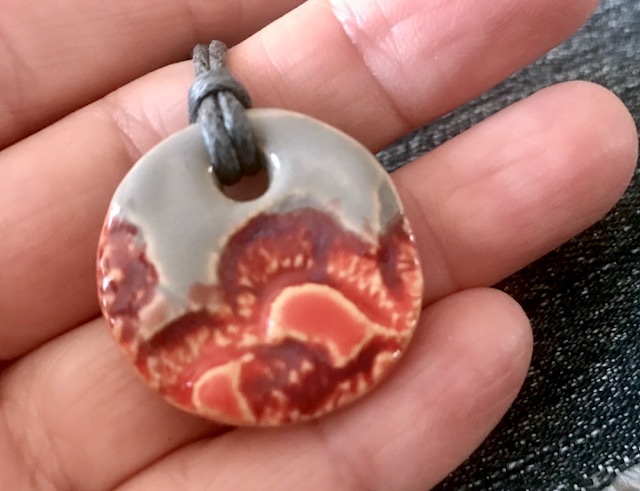 A very unusual, one of a kind piece of wearable art, this pendant is made from stoneware clay that was imprinted with fabric for an interesting texture. The glaze is a metallic smooth matte black, and the accent star is made of genuine black diamond. Measures approximately 1-1/4″ across at its widest point x 1-1/2″ high, including the star accent. The cotton cord is adjustable in length. Wear it long, or pull the slip knot at wear as a stunning choker. This is an elegant and versatile modern style pendant. The woven texture is reminiscent of snakeskin. 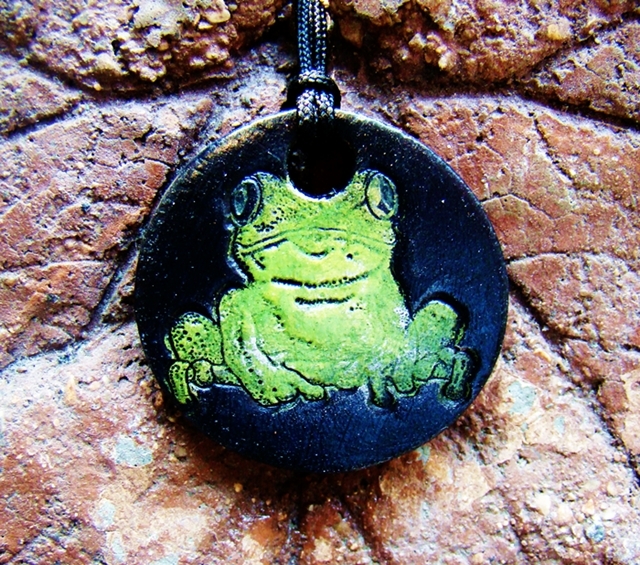 The pendant was colored with an oxide wash, then glazed with a clear gloss glaze. Length is adjustable with sliding knots on its cotton cord. 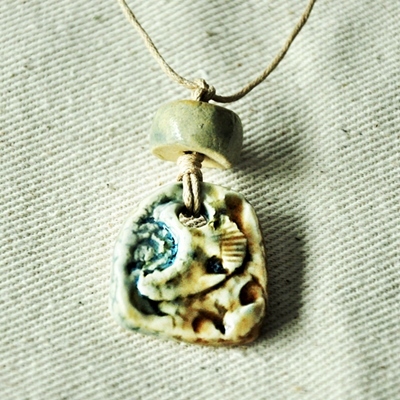 Made from stoneware clay that was imprinted with a vintage lace pattern. 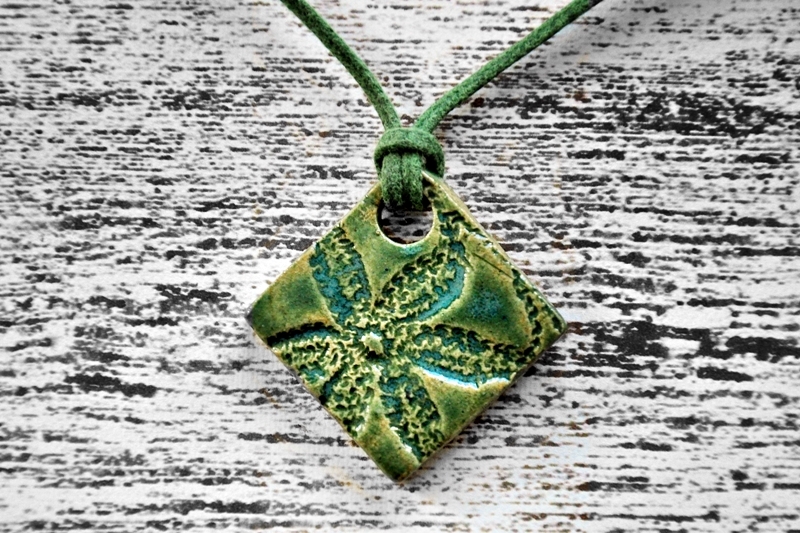 The glaze on this pendant is a dark, rich leaf green, resonating with nature. The matching waxed cotton cord is adjustable in length. Measures approximately 1-1/4″ across x 1-1/2″ high. Wear it long, or shorter by pulling the sliding knots. 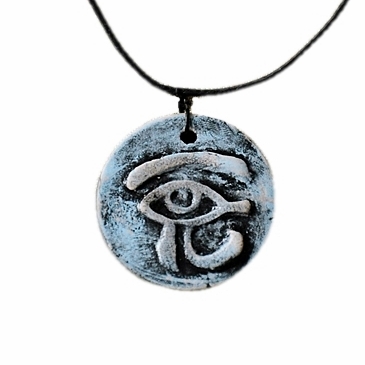 Hand Painted Egyptian Eye of Horus Pendant – Assorted Colors Available. Horus was the son of Isis. Let him watch over you, and offer his protection. Pendant piece approx. 3/4″ diameter. Cord length is adjustable. The edge of a vintage doily has served as a simple flower on white stoneware. 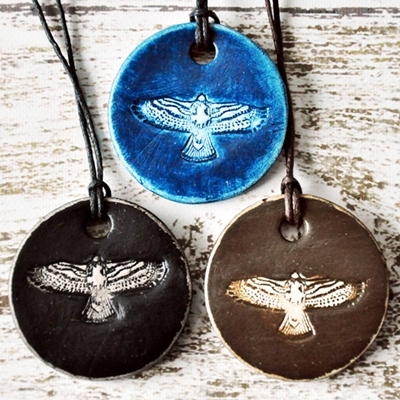 Colored with a medium blue oxide wash, this pendant was left unglazed for a matte finish. Length is adjustable, with sliding knots on the cotton cord. Waxed cotton cord; Length is adjustable. 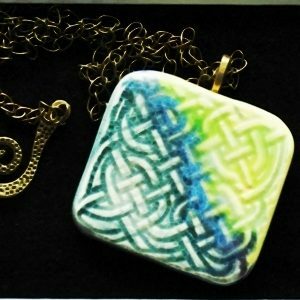 This one of a kind pendant is made from stoneware and glazed in purple and blue on white. Antique bronze finished bale and chain with attractive toggle clasp. A great piece that will last a lifetime. Pendant piece measures 1.5″ (3.8 cm). Chain is 20″ (50.8 cm). 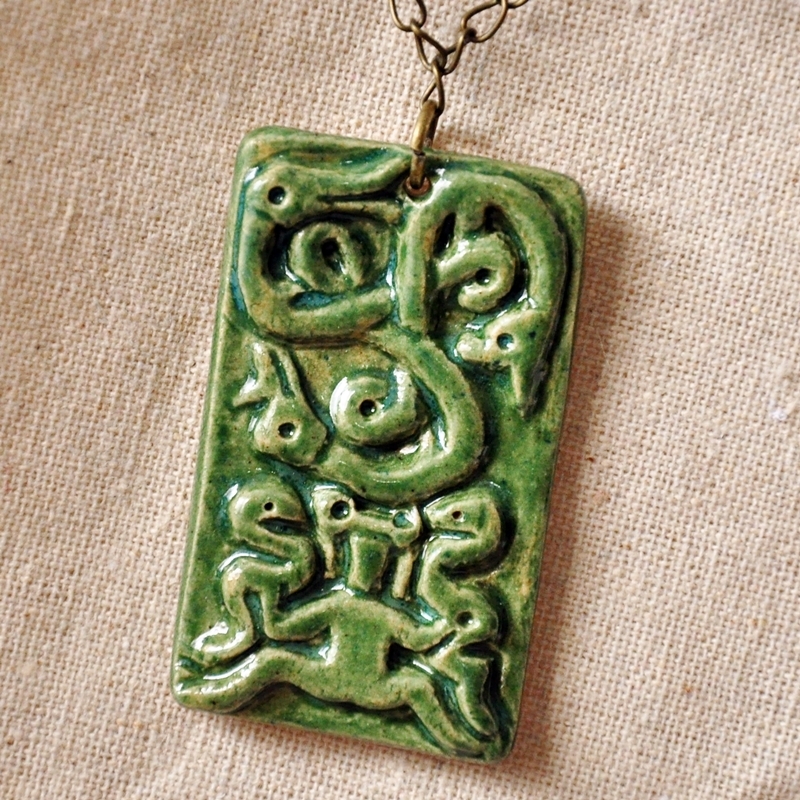 This one of a kind pendant is made from stoneware and glazed in spring green and blues. Antique bronze finished bale and chain with attractive toggle clasp. A great piece that will last a lifetime.